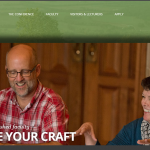 The Sewanee Writers ‘Association Conference is a writers’ conference is held every summer on the campus of the University of the South in Sewanee, Tennessee . The conference was founded in 1989 by director Wyatt Prunty and is largely financed by a donation from the estate of renowned American playwright Tennessee Williams . The conference takes place over twelve days, during which participants attend writing workshops, lectures, panel presentations, lectures on the art of poetry, fiction and playwriting, and many social events. From July 19–31, 2016, the University of the South will host the 27th session of the Sewanee Writers‘Conference. Thanks to the generosity of the Walter E.